Vertical Blinds and Panel Blinds often get overshadowed by Roller Blinds and Venetian Blinds. However, these sliding options can be preferred over others due to their practicality and sleek lines. If this sounds good to you, then read on! Vertical Blinds are timeless and contemporary window coverings. Available in 90mm and 127 mm slats, Vertical Blinds are suitable for very large as well as very small window openings. They allow for the versatility of allowing light to be directed or fully opened or closed. The most common Vertical Blind is the 127mm. slat. These are wider than the 90mm. options. The 90mm. slats are preferred for home use, while the larger slats are generally used in offices. Most Vertical Blinds come with a set of weights and chains at the bottom. The weights ensure the slat hangs straight and the chains prevent the slats from moving independently from the others. It is quite common to use Vertical Blinds in factories. Factories often have many very large windows. Opening and closing Vertical Blinds is effortless. 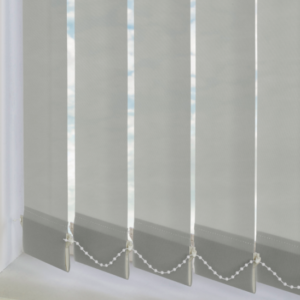 Available with wipeable fabrics, these blinds are practical choices for areas with a large amount of windows. Customers love the array of color choices. From blues and reds to neutral greys and neutrals, we’ve got all patterns and solids available. The most popular options are wipeable PVC slats.. These are not only beautiful but practical as well. Vertical Blinds are practical for all window openings. Whether the customer wants them stacked to the left, right, or centre split, they are customisable to each space. A customer can choose different openings for each window of their home or office. A Vertical Blind’s long lines creates a visually elongating feel to your room. Your space will feel larger and higher due to the Vertical slats. 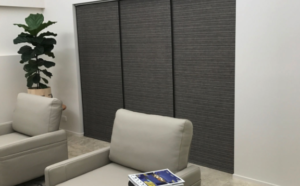 Customers might prefer a Vertical blind for a sliding door. 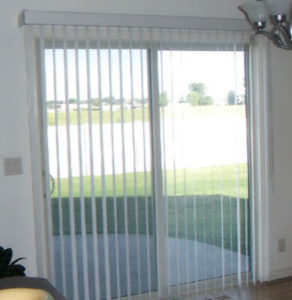 These blinds can be swept to the side, allowing only the open portion of the door to be exposed. This means the rest of the room can be protected from harmful UV rays while allowing access in and out of the room. These blinds allow for maximum control over how much light enters in with these large windows. There is a speciality product available in South Africa that consists of wavy slats. 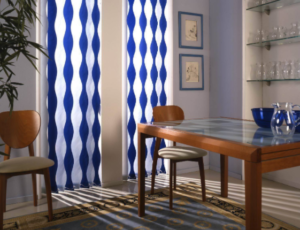 These Vertical Blinds are a great option to modernize a large window. They also allow the window to become a focal point of the decor in the room. Panel blinds are available in high end, printed fabrics that can be custom coordinated. Because of their wide panels, Panel Blinds make more of a statement than Vertical Blinds. They’re sort of a hybrid between a Roller Blind and a Vertical Blind. el, the more space it will take up. But the narrower the panel, the more busy the window tends to look. If we are going to center split a window then we always choose an even number of panels for uniformity and symmetry. At the quotation, we will be able to work out for you the approximate size of each panel. This will help you visualize what your blind will look like. Panel Blinds are often a less expensive and less permanent solution to create a room-within-a-room. A Panel Blind makes an excellent room divider. Both Vertical Blinds and Panel Blinds are fitted with rust-free brackets. This means you get more bang for your buck as they have increased longevity. 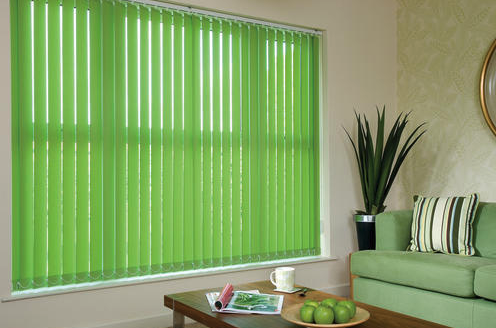 This also means that Vertical Blinds and Panel Blinds are suitable in humid and damp environments. The only caveat is that only certain slat materials are recommended in these areas. Don’t worry, our friendly staff will inform you of all this at the time of quotation. Both Vertical Blinds and Panel Blinds are easy to operate. Unlike Venetian Blinds, they glide effortlessly along the track without needing a lot of muscle strength. The customer gets to choose which side the controls are on for increased ease of use. Both Vertical Blinds and Panel Blinds come in light filtering as well as blockout options. This means that the customer has complete control over the amount of light that enters the room. Panel Blinds are available in Sheerweave options as well! Love the look of Bamboo Blinds? Panel Blinds are offered in Bamboo Materials as well! Light Filtering fabrics allow our customers to allow some light into their homes while maintaining their privacy. 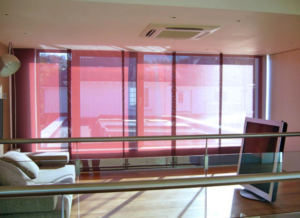 Panel Blinds are ideal for light filtration as well as for light control. Different thicknesses of materials allow for more or less light penetration. For large and small windows, Vertical Blinds and Panel Blinds can be used. In contrasting or complimenting fabrics, our customers love the versatility of these blinds. With tons of color choices and panel/slate sizes, there are choices for every taste, every budget, and every style.